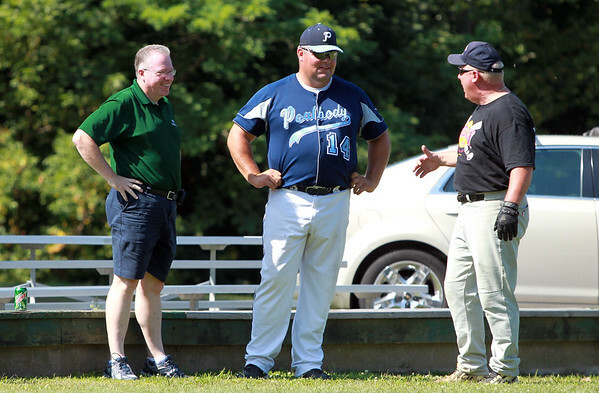 New Peabody Police Chief Tom Griffin, left, shares a laugh with Peabody/Lynnfield Police manager Mark Bettencourt, center, and pitcher Pat Conrad, right, during the 58th annual Peabody/Lynnfield Police vs Old Timers baseball game to raise money for Cops For Kids with Cancer and the Jimmy Fund on Monday morning. DAVID LE/Staff photo. 9/1/14.